An Italian-born tackle who came late to the game…and stayed. Born in Lucca, Italy, on June 19, 1924, Leo Nomellini was a latecomer to the game of football. Although his family came to the US when he was an infant, Nomellini didn’t play the game until 1942, when he joined the Marines. In 1946, after serving in World War II, Leo received a football scholarship to the University of Minnesota. He was a starting guard, but switched to tackle the following year. He was named All-American in 1948 and 1949. Upon graduating, Nomellini was a San Francisco 49ers first draft choice in 1950. For his first three seasons, he played offensive tackle, earning All-Pro status in 1951 and 1952. In 1953, he switched to defensive tackle, where he was All-Pro that year – and 1954, 1957 and 1959. Nomellini retired in 1963. In his 14 years of professional play, he had never missed single game. 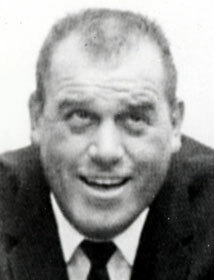 He was inducted into the National Football League’s Hall of Fame in 1969 and the National Italian American Sports Hall of Fame ten years later. He is the only member of the Pro Football Hall of Fame who was born in Italy. Nomellini died on October 17, 2000.